Stumbling across your camera buried in mud 20 months after losing it in a devastating earthquake is one thing; discovering that all the photos on its memory card are still retrievable is quite another. But that’s what happened to New Zealand resident Martin Burley this week. And the icing on the cake? The card contained photos taken during his wedding and honeymoon, images he and his wife, Fen, had assumed were lost forever. According to Stuff (via PetaPixel), Martin lost his camera in the damaging earthquake that struck Christchurch in February, 2011. He and his wife had just returned from their honeymoon, and had only been back in their home an hour when the quake hit. In the ensuing panic to evacuate their crumbling house, the camera – with more than six months’ worth of pictures on its Adata 4GB SDHC memory card – was washed away with other belongings in silt more than a meter deep. The newly married couple, though upset by the loss of the precious photos, accepted there was nothing they could do and carried on. Then on Wednesday evening, a full 20 months after the quake, Martin noticed an object sticking up out of his driveway. On closer inspection, he realized it was his long-lost camera. As you can see from the image above, the snapper was in bad shape, but Martin wondered if the memory card might be made of sterner stuff. 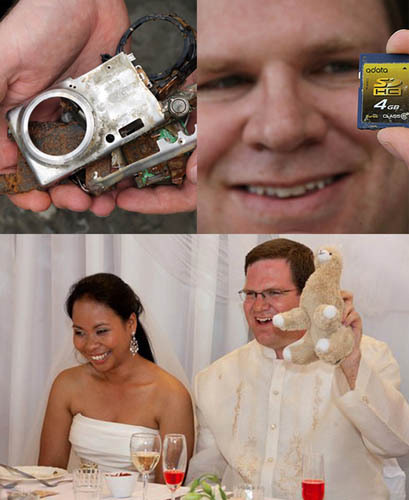 To his astonishment, following “a bit of tinkering” with the memory card on his computer, the New Zealander was able to recover all the shots contained on it, including those from his wedding and honeymoon. Martin said recent heavy rain in the town churned up his driveway, helping to bring the camera to the surface. The story is certainly a great ad for the durability of the Adata memory card, and brings to mind a similar tale from a couple of months back when a Vermont man recovered photos from a SanDisk CompactFlash card that had been lying at the bottom of a creek inside a DSLR camera for three years.